It is the season again and I saw Cherries in the supermarkets. I love this fruit because of its sweet sour taste and it is great for binging. The fruits are bite size so it is so easy to finish a box of it without even knowing it has gone down the stomach. I started to look at the things I eat after I went through the recent surgery. I am not paranoid but find it very interesting to note the facts about what I put into my mouth. There are things which I love to eat and they are rubbish. Of course I acknowledge that at times I need to have rubbish to make my Mind happy, not that my Body needs it. So now I went searching what cherries will do for me and found interesting facts. Scientific studies have shown that anthocyanins in the cherries are found to act like anti-inflammatory agents by blocking the actions of cyclooxygenase-1, and 2 enzymes. 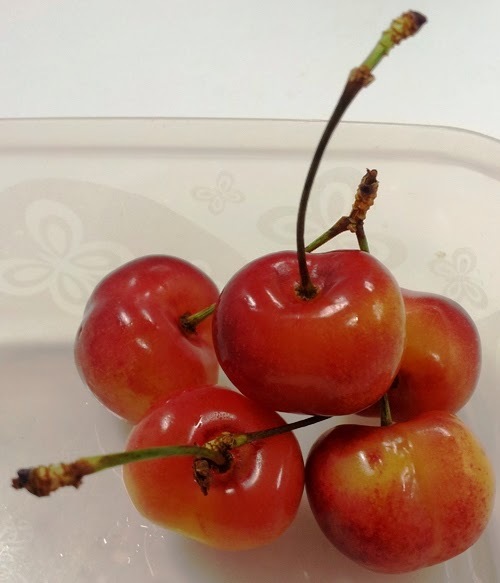 Thus, consumption of cherries has potential health effects against chronic painful episodes such as gout arthritis, painful muscle condition and sports injuries. That is why doctors advise to eat fruits with different skin colors. Many of us like to eat only fruit and peeled off the skin but the best nutrients are in the skins.